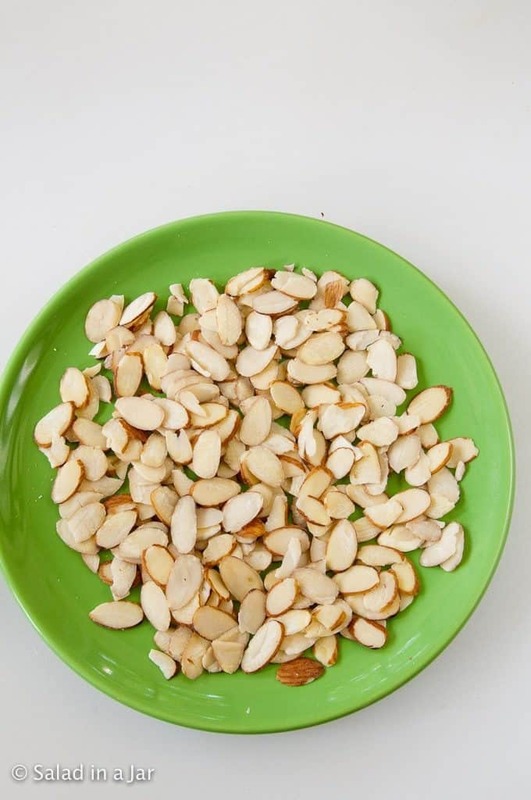 Using a Microwave to Toast Nuts or Coconut is a how-to guide for toasting nuts such as almonds and pecans (and coconut, too) in a microwave oven. When a recipe calls for toasted nuts, it’s easy to be tempted to skip the toasting and just dump them straight into your cake or cookie dough. 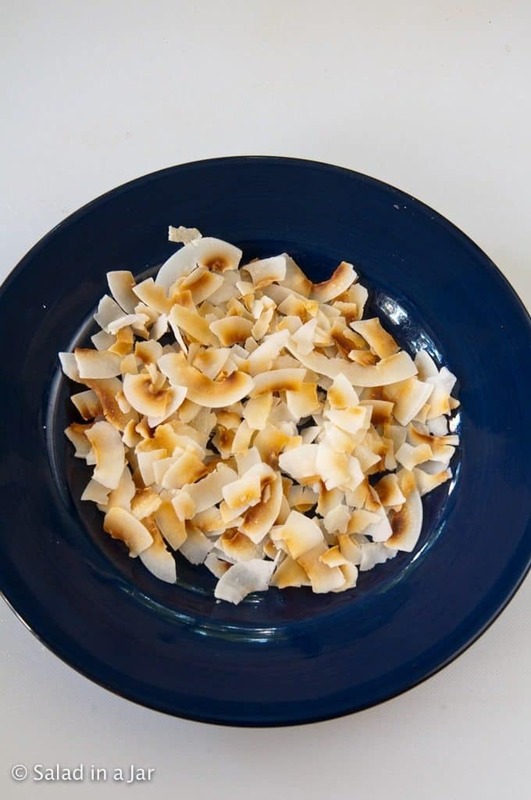 But it turns out that using the microwave to toast nuts or coconut is quick and easy, especially when you only need a small amount. The flavor difference is worth the trouble. I confess that I used to ignore the toasting step when in a hurry. But it makes a huge difference in taste if the nuts are toasted. The only time I don’t toast is when they are part of a topping that will eventually be baked. Microwaves are not standardized. Consequently, it’s impossible to give definitive times and levels that apply to everybody’s oven. Newer microwaves are more powerful, and therefore, faster. You will need less time. Older microwaves will need more time because they have less power. Smaller microwaves usually have less power, even if they are brand new. For this reason, don’t take the suggested times literally. Watch carefully until you know approximately how fast the nuts will cook in your specific microwave oven. It won’t be long before you can follow your nose as the best guide. When I can smell that toasty flavor, it’s probably time to stir or pull them out. 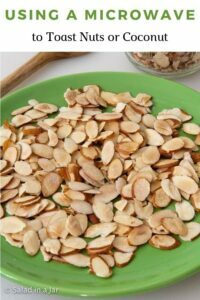 I’m showing you almonds here but the same process works with pecan and cashews. Cashews work better when they are coarsely chopped because of their irregular shape. You can do the same thing the same way with coconut. 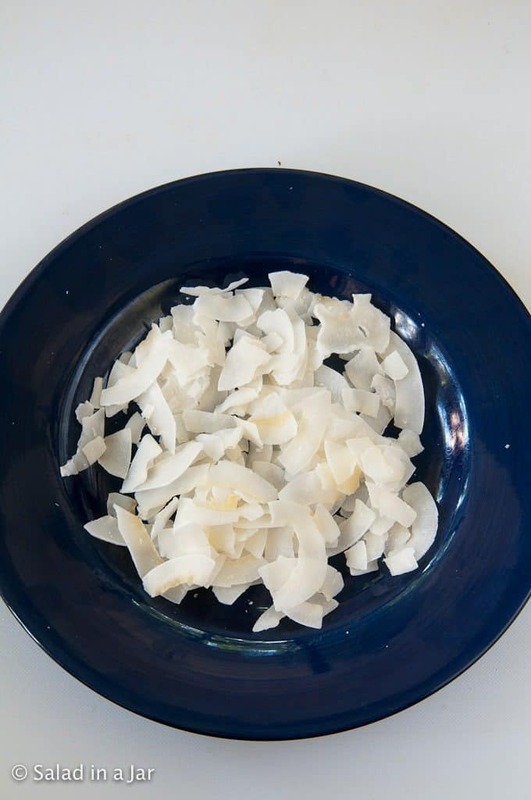 The time needed in the microwave will depend on how the coconut is cut, the amount of coconut, and the power of your microwave. 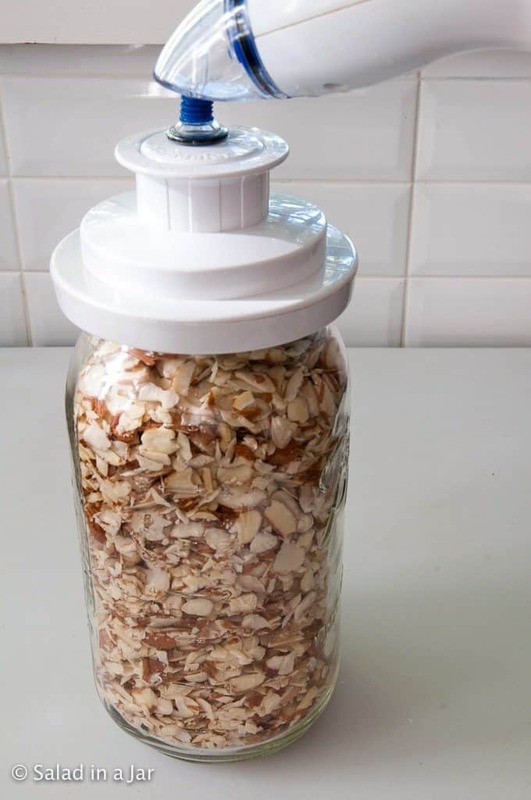 Use a vacuum-pack system along with an every-day Mason jar and a two-part metal lid. If you have a full size vacuum-pack machine, you only need a large mouth adapter like the white one seen below. 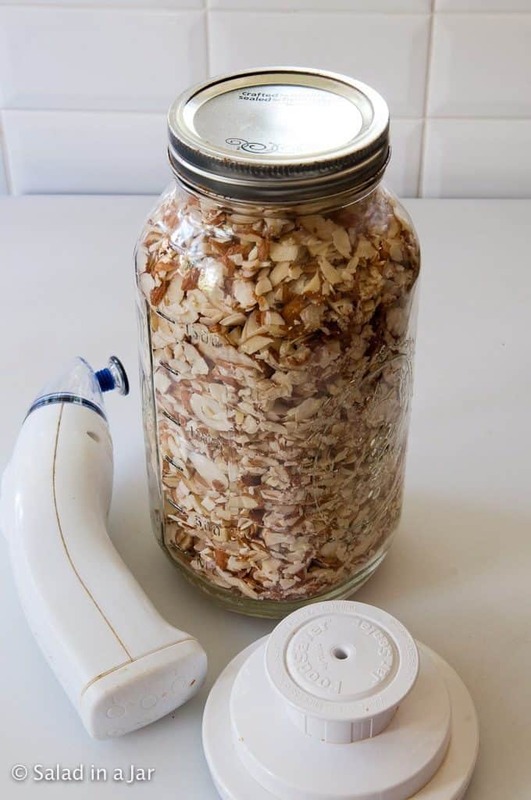 In the absence of a full-size machine, a hand-held machine will work perfectly and doesn’t take up room on your kitchen counter. Vacuum-pack nuts to preserve freshness. Use a Mason jar so you can see what you’ve got in the pantry. 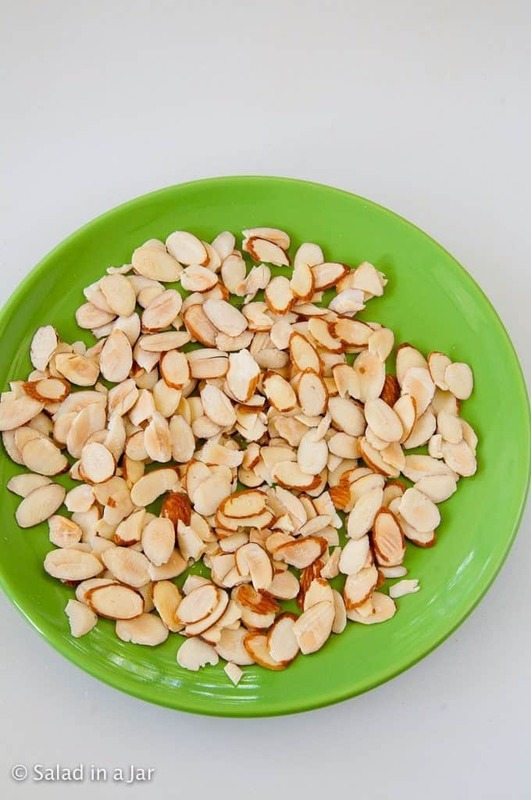 Evenly distribute nuts or coconut on a paper plate or micro-wave safe dinner plate. Cook on HIGH in the microwave for 1 minute. Stir. Repeat step #2 until nuts are nicely toasted. Watch carefully as every microwave cooks a little bit differently. Nuts can go from perfect to burnt in a terrifying flash. Pick out any burned pieces. There are usually very few. This post was originally posted in 2009. Pictures and instructions have been updated. Can You Make a Great Cream Pie Filling in the Microwave? This makes life so much easier—and tastier! Thanks, Paula! 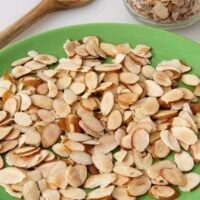 2 minutes total was too long for my almonds. I would suggest the first 1 minute then maybe 30 seconds the second time around. I had a LOT of burnt ones with the last 1 minute. Directions for microwave cooking must always be taken as a suggestion with lots of observation the first time or two you make a recipe with microwave instructions. I have two microwave ovens myself. The differences between them are astronomical so I must adjust times accordingly on every recipe I make. LOVE the salad in a jar idea…life can be so simple! 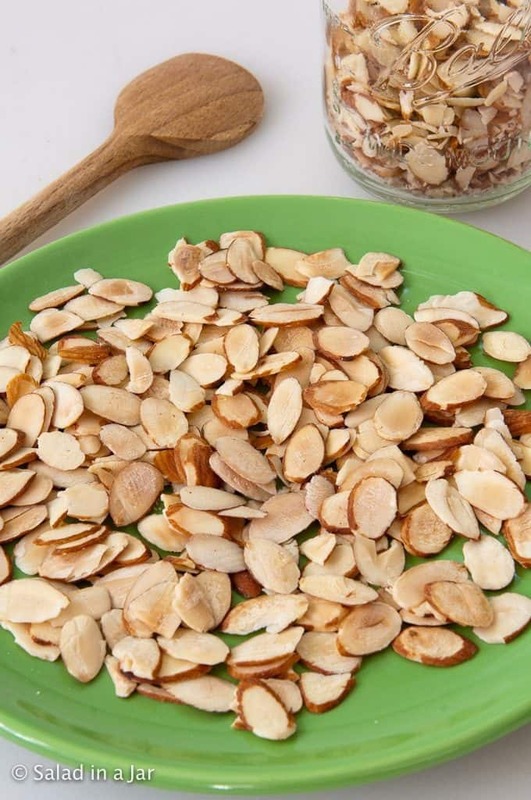 Try soaking the almonds for a day or two (change the water morning and evening) salting/seasoning them and place in a dehydrator until desired crispness. Great snack for kids especially and they keep in a jar for ages! Well, I am one of those that does toast the nuts but not anymore or at least not in the oven. Never thought about the microwave but I will definitely use now. Thanks, you are such a genius!! You could make these anytime for me! Great travel snack! I am sooo Guilty of skipping toasting! Thanks for this tip I will no longer skip toasting! Wow – what a great idea (that I never knew existed)! I am one of those that sometimes skip the toasting step knowing good and well that the flavor will be much, much better! Now – an easy and quick method that is surely worth a try! Thanks for sharing! Great idea and such a time saver…thanks! OM gosh ….I never knew that this could be done…where have I been? ….thanks so much for knowledge that will bring great flavor to my recipes.